It seems increasingly unfashionable to make a case for something using facts. I don’t quite know what it says that it took a Briton from outside the UK to remind everyone how persuasive such things can be. The Isle of Man’s status is not something to get into here. All that matters to a cycling site is that the island gave us Mark Cavendish, a man who makes proper, clear, unambiguous statements. Up until today, Cavendish had never actually beaten Marcel Kittel when the two have gone head-to-head in a sprint. He also had a reputation for slowly working his way into the Tour de France, winning stages later rather than sooner. So everything seemed against him. He hadn’t even been training properly for the Tour, as he’s had rather more than half an eye on getting track fit for the Olympic Games. The question ‘Can Mark Cavendish beat Marcel Kittel in a sprint?’ was therefore not even being asked. How typical of the Manx Missile to answer it anyway. It was a flat finish, a fair fight, and the excuses were all Cavendish’s – but still he was the quickest. I’ve probably given a bit too much away with that subheading. I haven’t really got much else to add. He tore his jersey, shorts and skin; his shoulder hurts; but he got back to the peloton and didn’t lose any time. I’ve withheld some details this time. I’m learning. A Katusha rider – I think it was Michael Morkov – clipped the foot of a barrier and properly went flying, taking down a whole bunch of other people as he rattled around the road like a fleshy pinball. He went to hospital, but I don’t think he’s too badly hurt. Needless to say, Geraint Thomas got caught up in both these crashes, although I don’t think he actually fell, which is quite uncharacteristic. … who’ll get to wear the yellow jersey on stage two, for the first time in his career. According to cycling journalist Richard Moore, an Australian television reporter asked Cav whether it was nice to have the respect of the other riders in the peloton after such a win? Never say never, but Cavendish better make the most of that yellow jersey because he’s probably going to lose it. 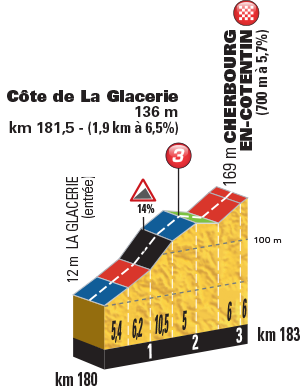 Stage two is pretty much flat but with an uphill finish which should rule out most of the sprinters. We’re probably looking at Peter Sagan, Michael Matthews and maybe at a push John Degenkolb. Or maybe they’ll race mega-hard and it’ll be all the general classification fellas. This is the crucial bit of road. It’s a third category climb, then a dip, then a rise to the line.